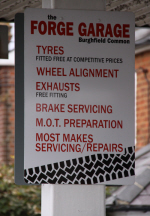 The Forge Garage is a well established garage in Burghfield Common. We are easy to find on the Burghfield Road just down from the Chemist and next to the parage of shops including the grocers, bakers and pet shop. Forge Garage are members of the "Trust My Garage" Scheme operated by the RMI. We supply a friendly, experienced, professional and reliable car and van servicing and repair service. Established for over 40 years we are well known to many of the locals in the Burghfield and Mortimer area. Our customers are largely based within a 20 mile radius of the garage. In additional to vehicle servicing and repairs our motor parts shop stocks oil, antifreeze, car cleaning kits, and a host of other handy items for your car or van. Pop in a take a look, your always welcome. Take a look around our website for more details of the services and vehicle parts we provide. If you don't see what your looking for on our website it is well worth giving us a call as if we can help we will !